Real-Time streaming chart of Canadian Currency Exchange with adjustable line type, time frame/period, and optional technical indicators is available here. Help - How to Use? Real-time streaming chart (Canadian Currency Exchange) can be customized. You can change the time period (1 minute, 10 minute, 1 hour, 1 day or 1 week), time frame (from 10 to 500 time periods), chart type (bar, candle, line, P&F) or change/add technical indicator (Volume, RSI, MACD, Stohastic, Momentum and others); just move your mouse over the chart and notice the Options button in the right top corner of the chart. Click on this button and then adapt the settings according to your needs in the drop menu. You can also Detach the chart in a separate window and zoom it or even make it full-screen. The Canadian dollar, or the 'buck' as it is commonly referred to, is the official currency of Canada, a North American nation touching the fringes of the Arctic. Being one of the seven main currencies of the forex trade market, it is represented by the code CAD and symbolized by the $ sign, or more specifically the C$. Apart from buck, some of the other nicknames of this currency are loonie, toonie, piastre, cent and sou of which the last three slangs are derivatives of the French e thus reflecting the widespread prevalence of this language within the country. The Canadian currency exchange rate is available in form of coins and bank notes of different denominations which are printed by the Canadian Bank Note Company and BA International Inc under the jurisdiction of the Bank of Canada. The journey of the Canadian currency started as the Canadian pound in 1841 as a result of the introduction of a new system known as Halifax rating in the Province of Canada. However, a major difference of opinion between the ruling sovereign in London and the local population existed where in the latter wishes to have their currency assimilated with the American currency and the former refused to oblige. Things were finally sorted out after a clash subsequent to which both the British as well as the American currencies were granted acceptance. Gradually however, the proclivity towards the US Dollar continued as was proven by the adoption of a decimal system similar to that of the US Dollar with the final transition occurring in 1871 to the acceptance of the Canadian dollar. Having been allowed to float in the aftermath of the Bretton Woods system, the Canadian currency exchange rate surpassed the value of the US dollar for the first time on 20th August, 1957 after which it fell again and remained at a fixed rate till 1970. During that time, since the country was under the grip of inflation, the currency was allowed to float as a counter-inflationary measure and it embarked on a steady climb in the following years. The inflationary trend in the value of the Canadian currency exchange rate had been on the lower side during the last decade of the twentieth century but soared up at the turn of the new millennium to become comparable with the high inflation of the past. 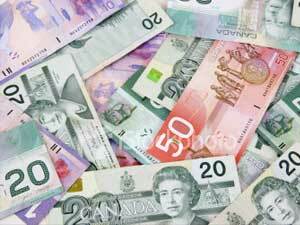 Unlike all other currencies which are adjudged in comparison with different currencies of the world, the Canadian currency exchange rate has always been judged relative to the value of the US dollar. Therefore, the Bank of Canada also does not concern itself much with a specific target value of this currency and has pointedly refrained from intervening in the forex market since 1998. The official stand of the bank is that value of the Canadian currency exchange rate should be a direct outcome of the market trends and occasions when the bank might have tried to influence its value are few and far between. In case of the Canadian currency, the most predominant factor which has had a major influence on its value is the movement of the US dollar. The relationship between the Canadian and the US dollar has historically been inversely proportional and therefore when the value of the Canadian currency rises against the US dollar its value as compared to the other currencies undergoes a decline. There are other macro-economic factors as well which contribute significantly towards the determination of value of this currency, the most seminal in the recent years being the oil exports made by Canada. This has caused a shift in the oil prices which in turn has caused the value of the Canadian dollar to fluctuate by a wide margin thus according this currency the status of a petrocurrency. The cross rate affect of the Canadian currency can be realized by studying the trend of the currency trend USD/CAD over a period of the last few years. This research would reveal that this currency pair has been known to follow a certain trend in its behavior and repeats this pattern every once in a while. It is on the basis of this pattern that the currency pain had touched its high point at the turn of the millennium and is rising sharply yet again remaining true to its pattern. However, this time round the cross rate effect of the Canadian currency exchange rate is determined by a relatively stronger Canadian dollar as compared to the traditional US dollar since it is breaking new resistance levels. The presence of the Canadian currency exchange rate in the forex market can be aptly summed up as it being reflective of the movement of the US dollar. During the recent years the forex market has witnessed a fall in the value of the Canadian dollar and this has been attributed to the stagnant economic growth of the country and the persistently surging inflation. Forex traders had been harboring the notion that the Bank of Canada would hike interest rates in order to counter the inflation but when this did not occur many traders were caught off guard and had to sustain losses because of having taken long positions in this currency. This unwarranted for fluctuation in the value of the currency in the forex market has had an adverse impact on the exports of the country as well with some of the major exporters reporting heavy losses as a fall out. The latest news from the financial market has reported a fall in the value of the Canadian currency exchange rate as an aftermath of the unstable economic situation reported by many countries around the world. This instability has caused even the stack markets to tumble thus heralding bad news for the US dollar as well which is at its 15-year low against the Japanese Yen. The downturn in the value of the US dollar as compared to the Yen has further spurred the fall in the value of the Canadian currency even though the US dollar has shown a positive growth against all the other currencies. Where to Invest Money? Now, Today, 2011, Safely, Great Returns?
" + x[i].getElementsByTagName("title").childNodes.nodeValue + "